The Rt. Rev. Kevin D. Nichols was ordained and consecrated as the IX Bishop of Bethlehem on September 15, 2018. He was elected on the first ballot of a Special Electing Convention held on April 28 at the Cathedral Church of the Nativity. Prior to his election, Nichols was chief operating officer and canon for mission resources in the Diocese of New Hampshire. Nichols was formerly president of the Diocese of New Hampshire’s Standing Committee and a member of the churchwide Task Force to Reimagine the Episcopal Church. Nichols began his ministry as a bi-vocational priest, serving a small rural parish while working full-time as an account manager and management trainer for Sealed Air Corporation, a packaging company. 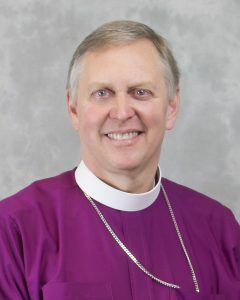 A former Roman Catholic priest who received his master of divinity degree from St. Mary’s Seminary and University in Baltimore, he was received into the Episcopal priesthood in 1999 and has served as rector of St. Stephen’s in Pittsfield, New Hampshire and St. Andrew’s in Hopkinton, New Hampshire. The bishop’s wife, Patti, is a licensed clinical social worker. They have four adult children: Graham, Lindsay, Bryan and Keaton, and three grandchildren.